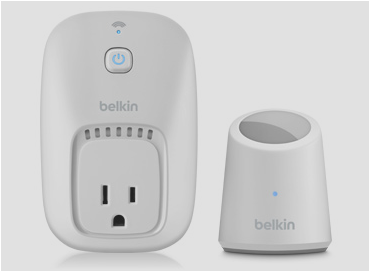 Belkin makes these great plug-switches as part of a new product family they are calling Wemo. You plug them into a socket, and then you can use your iPhone to turn that switch on or off and set-schedules - whether you're at home, across town, or around the world. I found them in the Apple store, and was attracted to them from my experiences with a similar product called the Modlet. I ran a trial over the winter for BC Hydro that included the Modlet, and was impressed when they reduced energy use by 44%, but I found their software and usability unsatisfactory. Belkin has done a much better job on the software, set-up, and overall user-experience. To sum it up in one sentence, the Belkin Wemo offers the same scheduling and controls options as the Modlet, and so should save just as much electricity - the difference is that the Wemo just works better. There are a number of reasons for this, all of which can be traced to better product design choices. Product design choices in the sense of "how it works" rather than in the sense of "how it looks." One example of this is that the Wemo uses Wifi, so it doesn't require anything additional to be plugged in & turned on. The biggest weakness of the Modlet for me was the USB key that plugs into a computer. The USB key was needed to connect the Modlet network (over Zigbee) to the internet for data collection and control. This was unsatisfactory for the purposes of remote control, since it would require a computer to be left turned on all the time. You plug them in one at a time, and use an app on your phone to connect to a temporary wifi network the device starts up with - something like "Wemo-6F1"
You connect to that wifi network with your phone temporarily. Then you open the Wemo app, select the wifi network you want the device to connect to and then enter the password for it. The app then updates the Wemo with that information and it then connects to your wireless network. As for actually using the switch, yes it works as advertised, which is of course - good product design. The device itself has a button on it to switch it on or off manually. The app is beautiful, simple, and gives instantaneous feedback - the kind of feedback that gives you confidence that it's going to work. Here's a great example - I've spliced 3 screen-captures together to show what happens when you activate the switch and there is a momentary delay. I didn't notice it at first because it happens so fast, but when away from home the yellow transition lasts for half a second or so. It's brief, but it is important that it is there. That is good, polished product design. The physical shape is a bit on the ugly side. In fact, the motion-sensor option is really quite clumsy looking and results in a long cord that trails from the power outlet to wherever you position the motion sensor. The modlet had a much more pleasing, quirky shape, and I liked how it simply covered-over your previous outlet, more like a socket replacement than a wall-wart type plug. The Wemo also doesn't measure power consumption like the Modlet does, and the Modlet gave individual control and measurement for each of the sockets it covers. I was amazed how valuable being able to see energy consumption data and show it to others was in my thermostat trial. We are visual beings, and being able to see a picture is really valuable. The Wemo also uses more power than the Modlet. In my measurements with a Kill-a-Watt, the Wemo uses about 1 Watt of power whereas the Modlet uses only 0.2 Watts. While neither of these is a lot of power, a factor of five difference is important if a lot of these are deployed. Regrettably I think it may be a consequence of the Wemo using Wifi, and the Modlet using Zigbee. Zigbee is a much lower-power networking technology, but then again - not having to set-up or add another control box in the home for a Zigbee network is probably a worthwhile design choice. Ecobee makes a similar product that they call a Smart Plug and I have only good things to say about Ecobee from the BC Hydro trial. The Ecobee thermostats were the run-away-stars of that trial - they were reliable, effective, and cut our heating bills by a whopping 55%. Ecobee has an iPhone app for the thermostat that I can confirm works really well, but for the moment their smart plug appears to be only controlled through their web-portal, which isn't as much fun for a remotely controlled device. I believe their smart plug does collect usage data, and they've got that and a history of reliability going for them. I haven't had a chance to try it out yet, but I'll write it up if & when I get a chance to. The Ecobee connects to the smart plug over zigbee, and since the thermostat is always on, it doesn't require a computer to be left-on all the time. The Modlet is also an alternative. I think they have the nucleus of a great product there, but they need help with their software, as well as their connection gateway - a little zigbee connection station that obviated the need for a computer is what I think the product needs, or else to team up with someone like Ecobee or Nest - since those devices are always on, have internet connections, and could serve as Zigbee gateways as well. I did hear from a little birdie that a connection gateway is on the road-map, but for now it's more useful as a programmable timer than it is as a remotely controlled switch. I think the Wemo was a pet project that Belkin decided to try out to see if it got much traction. I think they are finding that it is - because they've done the foundations of the product very well. If it continues to take off they will no doubt put more effort into it, with the potential for some very interesting additional products in future. They are soliciting and revealing some product plans on this user forum, and I'm pleased to report that they do include power measurement, and I think they will expand into other devices for around the home like light-bulb dimmers, light switches, bathroom ventilation fan schedulers, and perhaps remote door locks and security cameras - the whole raft of gear that the home automation crowd has been hobbying away at for years. As a result of their system only requiring one or two buttons and Wifi, it could also be suitable for time-delayed dishwashing machines, clothes-dryers, and scheduling your hot-water heater for example. I think something is starting to happen in this product space - call it Home Automation, Home Energy Management Systems, or I think I prefer simply - Home Controls. Between Ecobee, Nest, Modlet, and Wemo, there are some decent products coming into the market at the moment - all of them made more attractive by that computer-in-your-pocket called a smartphone.